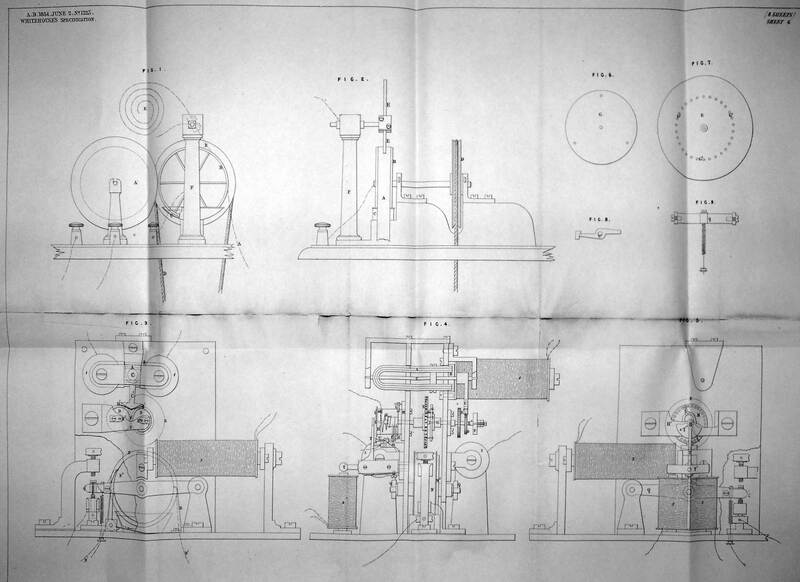 In this article Steven Roberts examines some of Whitehouse’s telegraph patents, the prelude to Whitehouse’s work on the Atlantic cable. 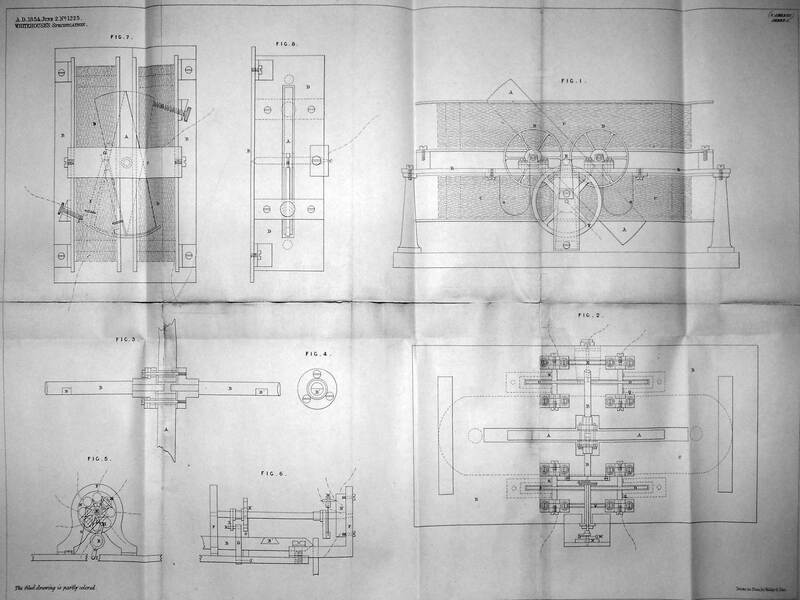 See this page for a full list of Whitehouse's patents. Wildman Whitehouse’s first patent was dated December 12, 1853 from his address in Brighton, where he was practicing as a surgeon. It was the 2,885th patent granted in the year 1853 and was for the ‘Invention of Improvements in effecting Telegraphic Communication’. It was described in thirteen pages of text and two sheets of drawings. It was a form of chemical telegraph by which the message is recorded on paper made sensitive to electric current, or as Whitehouse terms it, “electro-chemical decomposition”, intended to use either galvanic or magneto-generated electricity. The transmitting device was termed the “manipulator”. At its most complex, the “manipulator” was enabled to send sixty-three different combinations of roman and phonetic alphabets, including ligatures, double and treble letters from single button keys. To accomplish this the “manipulator” required a circuit of eighteen wires. The simple “manipulator” required that several of twenty-seven buttons be pressed simultaneously to send a single letter. The “compound manipulator” permitted sending with pressure on a single button. The buttons were also enabled to manage the switching of the circuits. The receiver utilised either a roll with a narrow tape or, a significant difference from previous receivers, a drum with a broad sheet of prepared paper and a damping trough. The “printing” element consisted of three “trackers” with multiple needle points that rested on the electro-sensitive paper and traversed with a rapid motion left to right across the slowly unrolling paper. This was to print letters or symbols to follow each other on the paper, placed in lines parallel to each other, reading from left to right. It was claimed that the apparatus was so quick in action that the words of a public speaker could be sent and printed as enunciated. 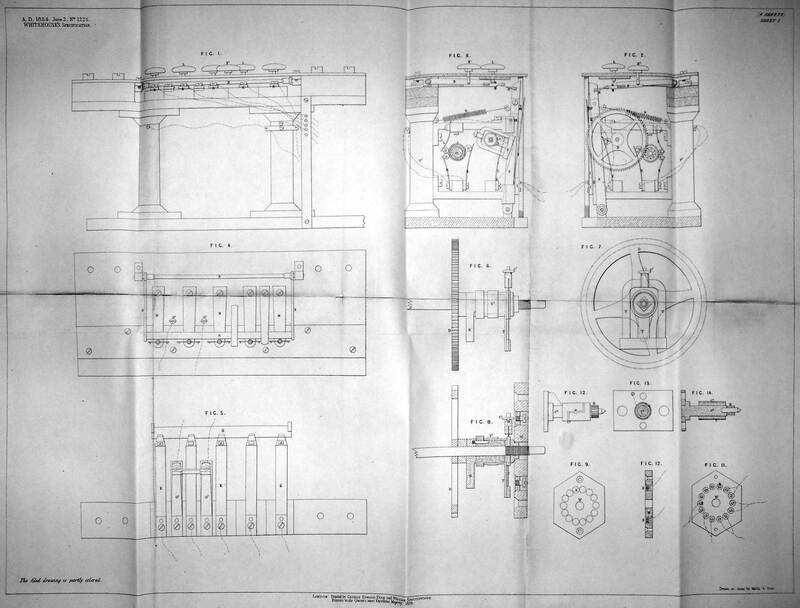 Although not spelled out, the receiving device must have required a clockwork element to rotate the roller or drum and move the “trackers”. “...another application of part of this system may be the automatic recording of extemporaneous music, by a simple arrangement in connection with a pianoforte or other similar instrument of music”. This was granted on June 2, 1854 from his address in Brighton for “Improvements in effecting telegraphic communications”, and numbered 1,225 of 1854. It was a major rationalisation of his previous chemical telegraph, reducing the number of wires needed in a circuit to one and introducing a code of symbols. 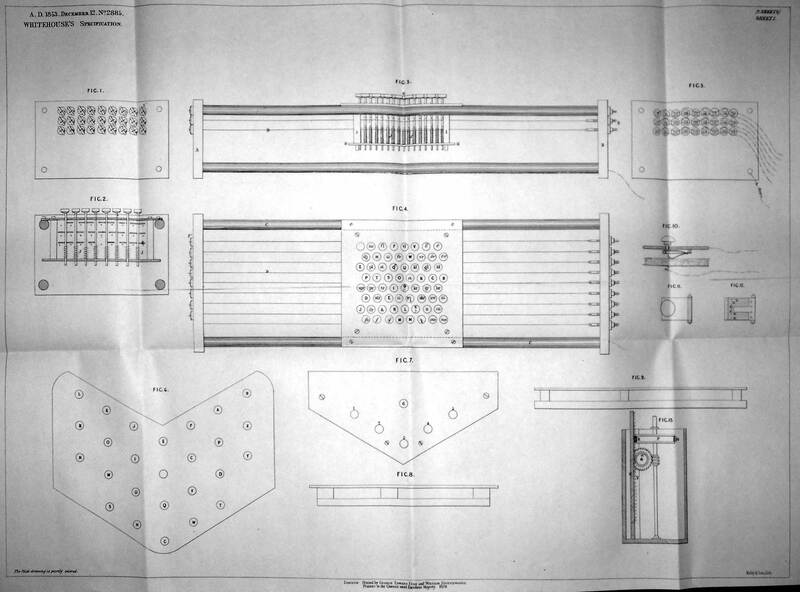 There were twenty-eight pages of descriptive text and eight pages of diagrams, “improving” on his first patent. This second patent contained several claims: these changed radically from the provisional version deposited on June 2, 1854 and the actual specification laid on December 2, 1854. 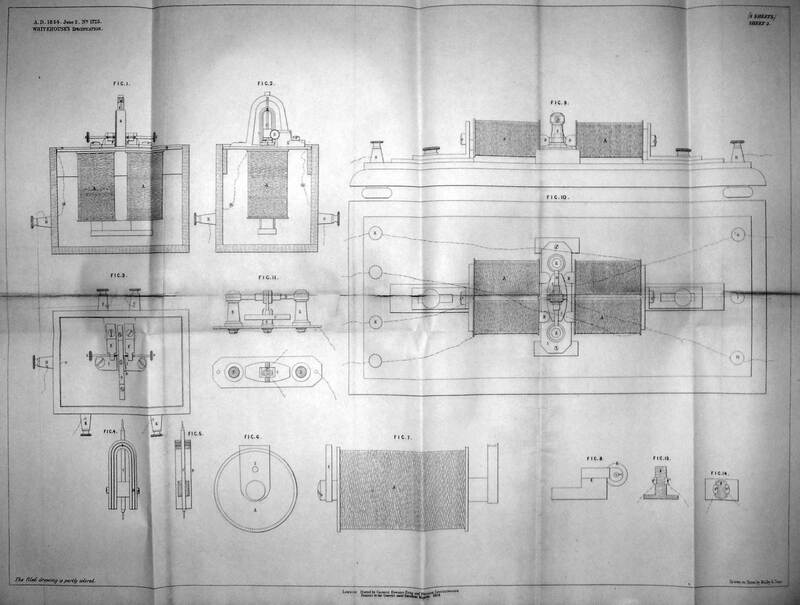 In the original set there were: 1] an automatic switch for using alternating current; 2] a commutator to use such currents in signalling; 3] a simplified “manipulator” from his 1853 patent for one-touch transmission of letters and 4] the ability to record messages from five or six stations simultaneously (!). All of these were intended for a single-wire telegraph circuit. The final specification was radically different from that first deposited, although containing descriptions of some of the above apparatus and detailing other “preferences” to enable their use. 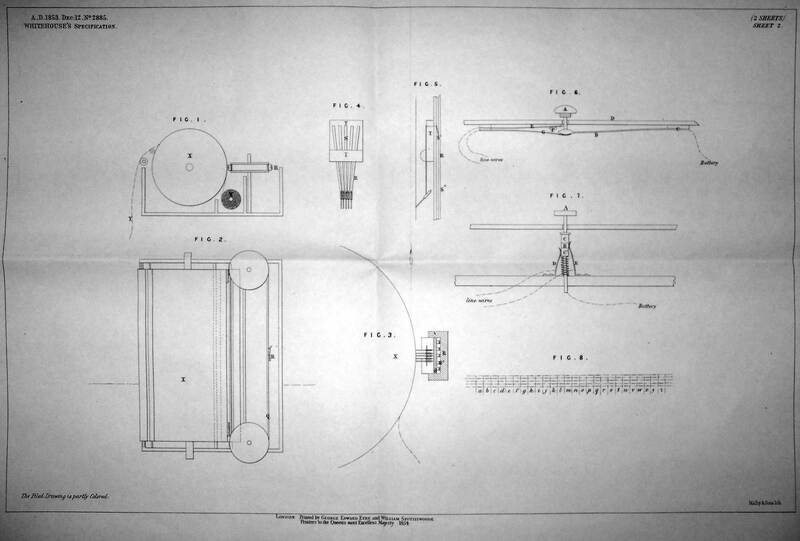 In this Whitehouse added but did not specifically claim, in addition to his original electro-chemical printing receiver, an electro-magnetic printer using carbon paper; an improved relay for use between the line and the printer, a “needle” commutator to manage the battery currents, the introduction of the induction coil for increasing the intensity of telegraphic circuits, a set of cells, called by Whitehouse “a Maynooth battery” (using iron, zinc, nitric and sulphuric acid), and a set of cells adapted from that patented by Alfred Smee (but contained in gutta percha cells). The “novel and original” elements were defined in the final summary as 1] the alphabet first used in the original patent, 2] the single-touch mechanism, 3] a modified alphabet, 4] an alphabet for a magnetic needle, 5] an alphabet for use in his electric decomposition printer, 6] a “traveller” for making and breaking printing circuits, 7] the new dial indicator and type printer worked from a relay, and the reversible step-by-step mechanism used in the dial and type-printer, 8] the various commutators and switches. Of all these claims only the modified or improved Smee battery was ever constructed; called the “Whitehouse Perpetual Maintenance Battery” or the “Whitehouse Laminate Battery”. It is not know if this immense device was ever used in service. The patent is remarkably vague and the line between “claims”, for which legal protection would be allowed, and “preferences”, which are merely padding, is unclear and appears to be something approaching a “try-on” with the Commissioners of Patents. In any event there were no challenges to either claims or preferences as the apparatus was ignored by the electrical establishment; as was Whitehouse’s equipment in the first patent. 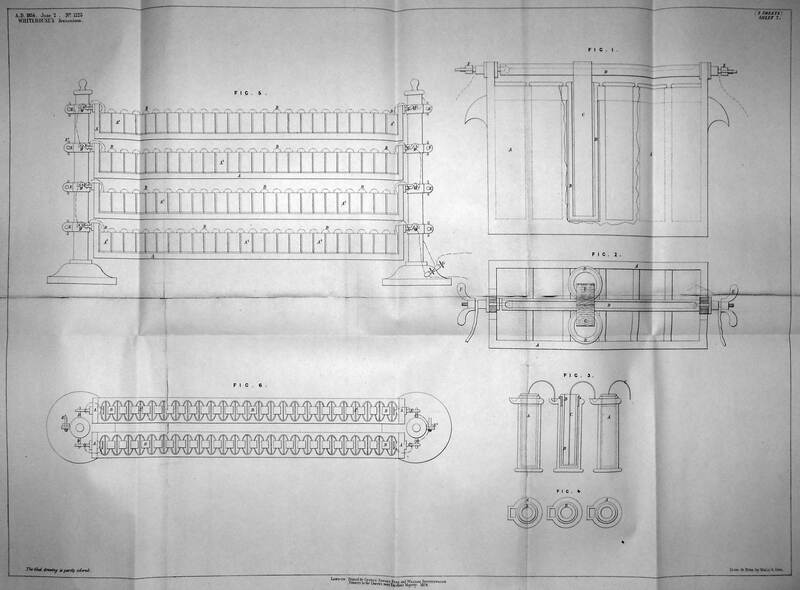 In this patent Whitehouse was clearly influenced by the work of Prof Nicholas Callan (1799-1864) of Maynooth College, Dublin, Ireland, who devised the original “Maynooth Battery” in 1848 and who had been experimenting with and developing ever larger induction coils since 1836. Callan may fairly claim to be the inventor of the induction coil, alongside of the much better known Heinrich Ruhmkorff. This is the most significant of Wildman Whitehouse’s patents; it was numbered 2,617 and dated November 20, 1855. The specification had thirteen pages of text and a single page of diagrams. He, or his patent agent, termed it “Improvements in Electro-Telegraphic apparatus, parts of which are also applicable to other purposes”. It is particularly important as it described the induction coil and relay that was used experimentally on the Atlantic cable of 1858. This patent is entirely different in conception from his previous brevets, being a set of improvements on the work of others rather than a development of his first efforts. There were five original claims of invention. In the Whitehouse induction coil, which was not illustrated in the specification, he altered the form of windings used in the coils. In the common induction coils of the time there were two insulated coils, one with thicker wire around the soft iron core, and a second with finer wire around the first. The primary current from galvanic cells being passed through the thicker wire then induced the secondary current in the finer wire. Whitehouse reversed these windings, having the thicker or primary coil surrounding the finer or secondary coil. These improved coils could be used singly, in parallel pairs or in parallelograms or squares. He also introduced smaller windings to fill in gaps in either the primary or secondary windings. The secondary current, he suggested, could be used for electro-telegraphic and other purposes, using current reversal as well as interrupting the current. 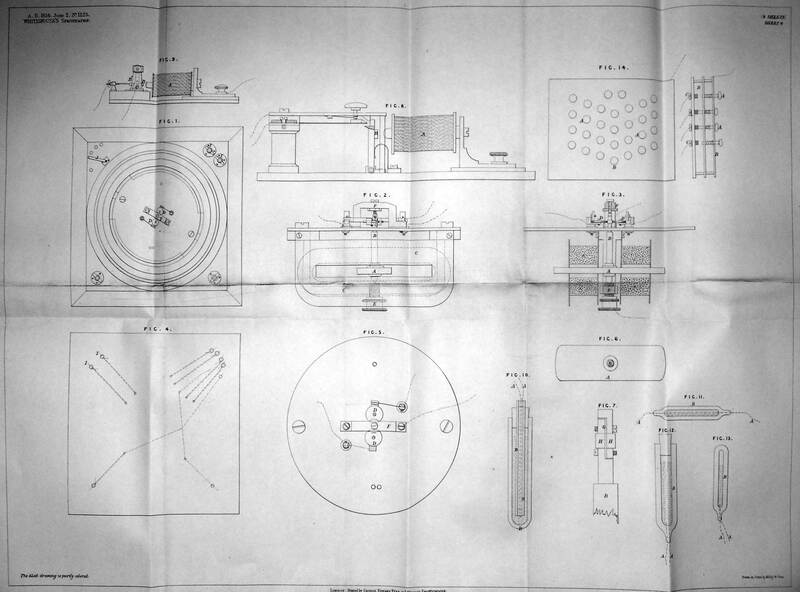 A subsidiary claim in regard to these induction coils was their use in electro-telegraphic purposes (a phrase unique to Whitehouse), blasting, ordnance purposes, and for electro-chemical decomposition (his chemical telegraph receiver). It is a general claim; there are no claims as to devices to achieve these purposes. His third claim was for improved relays for receiving currents from a distant station so as to call in to play a local battery to extend telegraphic circuits. The principle of local electro-magnetic relays was that adopted by S F B Morse to the design of Alfred Vail in 1846. The first improved relay possessed four magnetic pillars with a single pivoted electro-magnet having end cross-pieces moving between the pillars (Figure 1). The second improvement in relays consists of a lozenge-shaped iron piece pivoting between the poles of a horseshoe magnet controlled by insulated screws to adjust the sensitivity of relays. His third improvement to the relay is an adaptation of the so-called “Morse Relay” between the line circuit and the local circuit, using residual magnetism in the moving armature regulated by screws (Figure 3). The fourth claim is for a single-needle telegraph receiver, described as a “dead-beat magnetic needle instrument”, worked from a local battery and a relay by means of alternating current (Figure 4). 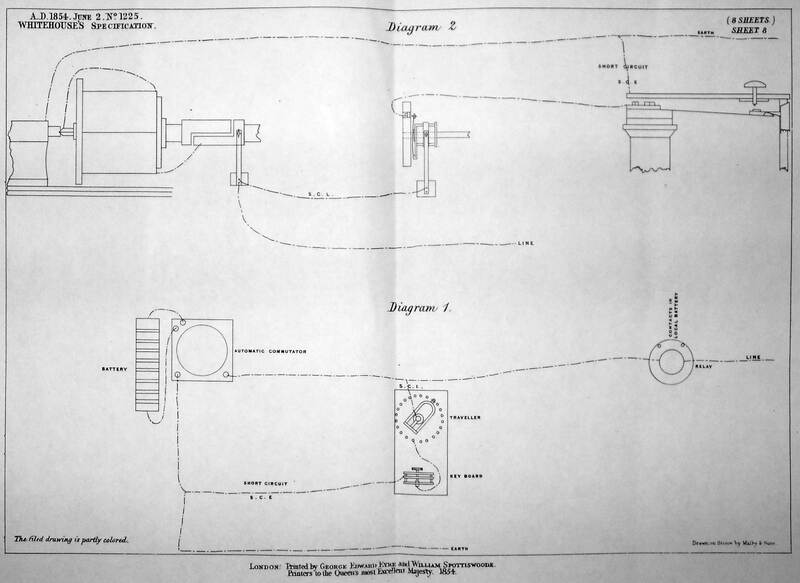 His fifth claim was for a step-by-step or dial telegraph receiver (Figure 12). His definitive claim was that these induction coils would overcome the retardation of signals that occurred in subterranean and submarine cables. He engaged in a series of well-publicised experiments on very long underground circuits with this apparatus, alongside of Charles Bright, the submarine telegraph engineer, and witnessed by S F B Morse. This gave Whitehouse the authority to challenge the electrical establishment, for his admission as one of the four Promoters of the Atlantic Telegraph Company and his appointment as Electrician of the Company. 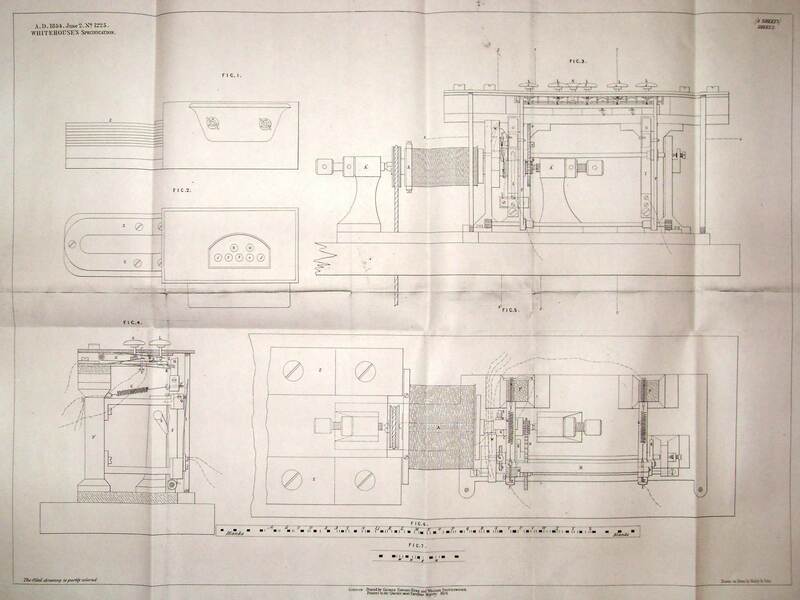 See also Allan Green’s notes on a large induction coil believed to have been made by Whitehouse.